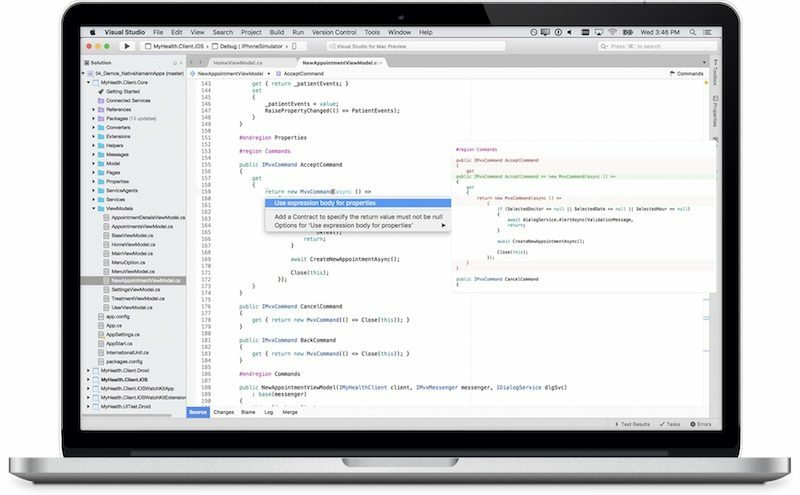 After spending months in preview, Microsoft today is officially launching its Visual Studio coding platform for the Mac (via VentureBeat). Visual Studio allows developers to code applications using Microsoft's integrated development environment (IDE) on Apple's macOS platform, which they can sync across both Windows and Mac devices. Thanks to integration with Xamarin, a cross-platform software development company that Microsoft acquired last year, Visual Studio encourages macOS and iOS developers "to use Microsoft’s development tools, since they will no longer need a Windows computer or virtual machine to do so." Xamarin Studio is expected to eventually close for good following a full integration into Microsoft. Visual Studio has been designed natively for macOS, according to Microsoft, letting developers manage their code hosted by any provider, including GitHub and Visual Studio Team Services. Developers can build, connect, and tune native mobile apps for iOS, macOS, and Android while also having the ability to create web applications thanks to support for ASP.NET Core. In terms of programming languages, the C# and F# languages are supported. There are three different versions of Visual Studio for Mac that users can download, including Visual Studio Community, Visual Studio Professional, and Visual Studio Enterprise. Microsoft markets Community as its free, but "fully-featured," IDE for students and individual developers. Professional targets small teams with subscription benefits, while more "demanding" users and projects with larger scale are suggested to look into Enterprise. For its cloud subscriptions, there are yearly and monthly options available to users interested in the higher-tier Visual Studio plans. An annual subscription to Visual Studio Professional costs $539/year while a monthly subscription costs $45/month. For Visual Studio Enterprise, users will pay $2,999/year or $250/month. Subscribers will be able to earn small credits back each month for the yearly tiers, contingent on their use of different Azure services. For a detailed breakdown of the differences between each Visual Studio subscription, including individual licenses, check out the app's new website. I honestly don't understand the love for Visual Studio here. I use it daily, I hate it. It's sluggish, bloated, and has quirky as hell autocomplete. Visual Studio, at least on Windows, is a first rate product, and C# is, in my opinion, one of the best languages out there bar-none. Very excited to see it ported to Mac. wow. i know this is primarily a mac board and yes, I'm a huge mac fan but that is actually big news. What the hell is up with that? Every MS application released for Mac OS has had this embarrassing problem. currently use VS on win to develop unity apps across web, android, and ios. wanted to do some dev on my mac at home but would prefer to use a dev env and editor same like what i use at work if possible... will download the community edition and see how it goes. Does it support the same plug-ins as the win version? Need the Unity plug-in and resharper. update: launches incredibly slowly and i don't see any plugins for unity or resharper. the default empty project they created for cross platform dev when i try running it doesn't seem to work either. It can't possibly be worse than xcode.